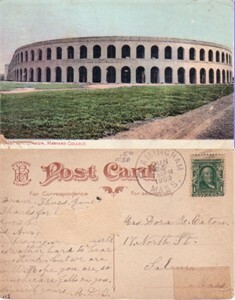 Original color postcard from 1909 or earlier showing Harvard Stadium, which when built in 1903 became the country's first concrete football stadium and first college athletics stadium. It was designated a National Historic Landmark in 1987. This stadium's fixed width also hastened the use of the forward pass, which obviously saved the game of football. Has moderate to heavy wear including rounded corners, a couple heavy creases, a surface tear on the back from tape removal. 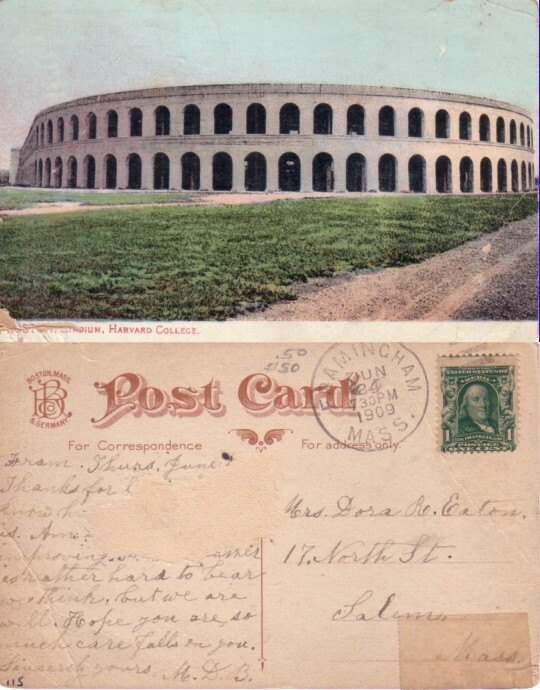 Postmarked Jun 24, 1909 in Framingham (stamp intact).